This all-suite Rosemont hotel offers guests the largest living space in the Chicago O’Hare market, fully furnished to exude an air of modern sophistication while maintaining functionality. Guests of this Rosemont, Illinois hotel near O’ Hare Airport stay in shape at our newly renovated fitness center and pool. Our hotel also features innovative in-room workout packages for busy travelers. Allie’s American Grill, our on-site Rosemont restaurant, serves breakfast, lunch and dinner every day . From our Rosemont, Illinois hotel we offer complimentary shuttle service to O’Hare International Airport and provide easy access to the Donald E. Stephens Convention Center, Rosemont Theatre and All State Arena. With flexible setup options and over 2,500 square feet of space, our Rosemont, Illinois hotel is perfect for meetings & special events. 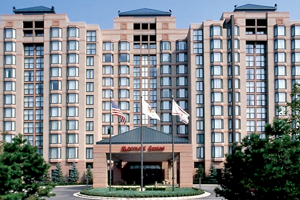 Whether choosing a Rosemont, Illinois hotel for meetings or a weekend away, you can ensure the Chicago Marriott Suites O’Hare will provide you with an exceptional stay in Chicago.